Andrew Ellicott Douglass, an early American astronomer, reported witnessing the Leonids meteor shower from a ship off the Florida Keys, the first meteor shower recorded in North America. Born, John William Strutt (Lord Rayleigh) (at Langford Grove, Essex, England), physicist, Nobel 1904 "for his investigations of the densities of the most important gases and for his discovery of argon in connection with these studies"
John William Strutt (Lord Rayleigh), (12 November 1842 - 30 June 1919) was an English physicist. He discovered scattering of light makes the sky blue, and published numerous papers on the wave nature of sound. One of the important pieces of experimental work he carried during his time as Cavendish professor was a standardisation of the ohm (the unit measure of electrical resistance). His work that led to the discovery of the inert gas argon brought him a Nobel prize in 1904. C. H. F. Peters discovered asteroid #77 Frigga. J. Palisa discovered asteroids #210 Isabella and #253 Mathilde. L. Carnera discovered asteroid #479 Caprera. Percival Lowell (13 March 1855 - 12 November 1916) was a wealthy amateur astronomer who was convinced that there were canals on Mars, and was the founder of Lowell Observatory in Flagstaff, Arizona. Lowell's greatest lasting contribution to planetary studies came during the final 8 years of his life, which he devoted to the search for Planet X, the designation for a planet beyond Neptune. The search continued after his death at Flagstaff in 1916; the new planet, named Pluto, was discovered by Clyde Tombaugh in 1930. The symbol for the planet is a stylized "PL", chosen in part to honor Lowell. M. Wolf discovered asteroid #907 Rhoda. K. Reinmuth discovered asteroid #1010 Marlene. The American Interplanetary Society performed static tests of a rocket based on the VfR design at Stockton, New Jersey. The motor produced 27 kgf of thrust for 20-30 seconds. It was damaged in the test and not subsequently flown. G. Kulin discovered asteroid #2043 Ortutay. L. Oterma discovered asteroid #2107 Ilmari. Purple Mountain Observatory discovered asteroid #2215 Sichuan. USSR launched Venera 2 toward Venus carrying a TV system and scientific instruments. It failed before reaching its destination. Venera 2 was launched on 12 November 1965 from Baikonur on a Tyazheliy Sputnik (65-091B) toward Venus, carrying a TV system and scientific instruments. On 27 February 1966, the spacecraft passed Venus at a distance of 24,000 km and entered a heliocentric orbit. Since the spacecraft had ceased to operate before it got to its target, no data was returned. During the 2h 18m Gemini 12-1 "stand up" EVA, Buzz Aldrin photographed the Earth and stars, and collected a micrometeorite experiment. Gemini 12 was the tenth and final flight of the Gemini series, which bridged the Mercury and Apollo programs. This mission, carrying astronauts Jim Lovell and Edwin "Buzz" Aldrin, was scheduled to perform rendezvous and docking with the Agena target vehicle, to conduct three ExtraVehicular Activity (EVA) operations, to conduct a tethered stationkeeping exercise, to perform docked maneuvers using the Agena propulsion system to change orbit, and to demonstrate an automatic reentry. There were also 14 scientific, medical, and technological experiments on board. Gemini 12 was launched from Complex 19 on 11 November 1966 at 3:46:33 PM EST (20:46:33.419 UT) and inserted into a 160.8 x 270.6 km Earth orbit at 3:52:40 PM EST. At 7:32 PM EST, rendezvous was achieved with the Gemini Agena Target Vehicle (GATV), which had been launched an hour and a half before Gemini 12. Docking with the GATV was accomplished 28 minutes later, at 4:14 Ground Elapsed Time (GET) on the third orbit, relying heavily on visual sightings due to problems with the onboard radar. During insertion of the GATV into orbit, an anomaly was noted in the primary propulsion system, so the plan to use the GATV to lift the docked spacecraft into a higher orbit was abandoned. Instead, two phasing maneuvers using the GATV secondary propulsion system were accomplished to allow the spacecraft to rendezvous with the 12 November total eclipse visible over South America at about 9:20 AM EST, with the crew taking pictures through the spacecraft windows. The first standup EVA took place with the hatch opening at 11:15 AM EST (19:29 GET) on 12 November and Aldrin standing on his seat with his upper body out of the hatch. The EVA lasted 2 hours 29 minutes during which Aldrin mounted a camera to the side of the spacecraft and collected a micrometeorite experiment, with the hatch closing at 1:44 PM. At 7:16 AM on 13 November, the crew reported little or no thrust was available from two of the maneuvering thrusters. At 10:34 AM on 13 November (42:48 GET), the hatch was opened for the second EVA. Aldrin was outside the spacecraft at 10:38, attached to a 9 meter umbilical cord. He first worked in the hatch and nose area, and then moved along a handrail he had installed to the adapter section where he used foot restraints and tethers to position himself in front of a work panel mounted on the rear of the adaptor where he performed 17 relatively simple manual tasks. He then moved to the target vehicle adapter area and carried out another series of tasks, including use of a torque wrench while tethered. He attached a 30 meter long tether stowed in the GATV adapter to the Gemini adapter bar. About a dozen two-minute rest periods were scheduled during the EVA to prevent Aldrin from becoming overtaxed as happened to previous spacewalkers. Aldrin reentered the capsule at 12:33 PM and closed the hatch at 12:40 PM. All tasks were accomplished, and total EVA time was 2 hours 6 minutes. At 3:09 PM Gemini 12 undocked from the GATV, moved to the end of the tether connecting the two vehicles, and began the tether experiment by moving in a circular orbit about the GATV. The tether tended to remain slack, but the crew believed the two craft slowly attained gravity-gradient stabilization. The tether was released at 7:37 PM. On 14 November the hatch was opened at 9:52 AM (66:06 GET) and Aldrin began the second standup EVA which included photography, additional experiments and jettison of unused equipment. The EVA ended after 55 minutes when the hatch was closed at 10:47 AM. Minor fuel cell and thruster problems were reported, but did not affect the remainder of the mission. The automatically controlled reentry sequence began with retrofire at the end of revolution 59 on 15 November at 1:46:31 PM EST, 94 hours after liftoff. Splashdown occurred at 2:21:04 PM EST in the western Atlantic at 24.58 N, 69.95 W, 4.8 km from target point. The crew was picked up by helicopter and brought aboard the USS Wasp at 2:49 PM, and the spacecraft was picked up at 3:28 PM. Total mission elapsed time was 94:34:31. All primary mission goals were successfully accomplished except performance of maneuvers using the Agena propulsion system due to fluctuations in the system noticed by ground controllers. There were minor fuel cell and attitude control thruster problems during the mission. The successfully performed scientific experiments were (1) frog egg growth under zero-g, (2) synoptic terrain photography, (3) synoptic weather photography, (4) nuclear emulsions, (5) airglow horizon photography, (6) UV astronomical photography, and (7) dim sky photography. Two micrometeorite collection experiments, as well as three space phenomena photography experiments, were not fully completed. L. Chernykh discovered asteroid #2266 Tchaikovsky. USSR's Cosmos 690 (Bion 2, Biocosmos 2) returned to Earth from its three week biomedical research flight. Cosmos 690 (Bion 2, Biocosmos 2), launched on 22 October 1974, carried albino rats for biomedical research. Soviet, Czech, and Romanian investigators subjected the rats to daily radiation doses from a gamma source by ground command. When they were recovered 20.5 days later, many rats had developed lung problems and their blood and bone marrow had changed more than those of control specimens. 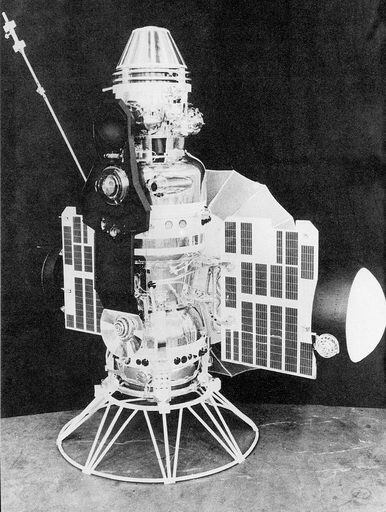 The Bion spacecraft was based on the Zenit reconnaissance satellite, and launches began in 1973 with the primary research emphasis on the problems of radiation effects on human beings. Launches in the program included Cosmos 110, 605, 670, 782, plus Nauka modules flown on Zenit-2M reconnaissance satellites. 90 kg of equipment could be contained in the external Nauka module. Harvard College discovered asteroid #2314 Field. NASA's space probe Voyager I made its closest aproach to Saturn, passing within 124,000 kilometers (77,000 miles) of the planet's cloud-tops, returning many interesting pictures and data. Voyager 1 spacecraft is an unmanned probe of the outer solar system, launched by NASA aboard a Titan-Centaur rocket on 5 September 1977 from Cape Canaveral. Its trajectory took Voyager 1 past Jupiter, and Saturn. It is now (2015) the most distant man-made object, and is expected to keep transmitting valuable data at least into the 2020s. Communications will be maintained until the Voyagers' power sources can no longer supply enough electrical energy to power critical subsystems. Voyager 1 is leaving the solar system, rising above the ecliptic plane at an angle of about 35 degrees, traveling at a rate of about 520 million kilometers (about 320 million miles) a year, and entered interstellar space on 25 August 2012. Originally scheduled to launch twelve days after Voyager 2, Voyager 1's launch was delayed twice to prevent occurrence of problems which Voyager 2 experienced after launch. When Voyager 1's launch finally happened, it was termed "flawless and accurate." 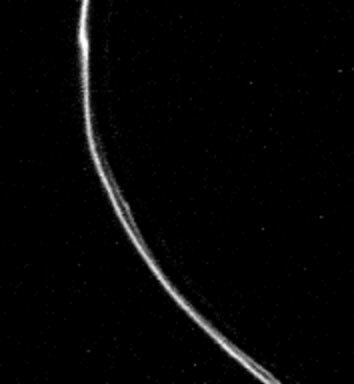 Although launched sixteen days after Voyager 2, Voyager 1's trajectory was the quicker one to Jupiter. On 15 December 1977, while both spacecraft were in the asteroid belt, Voyager 1 surpassed Voyager 2's distance from the Sun. Both prior to and after planetary encounters observations were made of the interplanetary medium. Some 18,000 images of Jupiter and its satellites were taken by Voyager 1. In addition, roughly 16,000 images of Saturn, its rings and satellites were obtained. Voyager 1 began photographing Jupiter in January 1979, and made its closest approach to on 5 March 1979, at a distance of 349,000 kilometers (217,000 miles) from the center of the planet. It finished photographing the planet in April. Voyager 1's Saturn flyby occurred in November 1980, with the closest approach on 12 November when it came within 124,000 kilometers (77,000 miles) of the planet's cloud-tops. The craft detected complex structures in Saturn's rings, and studied the atmospheres of Saturn and Titan. Its trajectory, designed to allow close study of Titan, took it out of the plane of the ecliptic, thus ending its planetary science mission. After its encounter with Saturn, Voyager 1 remained relatively quiescent, continuing to make in situ observations of the interplanetary environment and UV observations of stars. After nearly nine years of dormancy, Voyager 1's cameras were once again turned on to take a series of pictures. On 14 February 1990, Voyager 1 looked back from whence it came and took the first "family portrait" of the solar system, a mosaic of 60 frames of the Sun and six of the planets (Venus, Earth, Jupiter, Saturn, Uranus, and Neptune) as seen from "outside" the solar system. After this final look back, the cameras on Voyager 1 were once again turned off. Voyager has mounted to one of the sides of the bus a 12-inch gold-plated copper disk. The disk has recorded on it sounds and images of Earth designed to portray the diversity of life and culture on the planet. Each disk is encased in a protective aluminum jacket along with a cartridge and a needle. Instructions explaining from where the spacecraft originated and how to play the disk are engraved onto the jacket. Electroplated onto a 2 cm area on the cover is also an ultra-pure source of uranium-238 (with a radioactivity of about 0.26 nanocuries and a half-life of 4.51 billion years), allowing the determination of the elapsed time since launch by measuring the amount of daughter elements to remaining U238. The 115 images on the disk were encoded in analog form. The sound selections (including greetings in 55 languages, 35 sounds, natural and man-made, and portions of 27 musical pieces) are designed for playback at 1000 rpm. The Voyagers were not the first spacecraft designed with such messages to the future. Pioneers 10 and 11, LAGEOS, and the Apollo landers also included plaques with a similar intent, though not quite so ambitious. All of the experiments have produced useful data, except for the photopolarimeter which failed to operate. NASA launched STS 2 (Columbia 2, Shuttle 2), the first time a spacecraft was launched twice, carrying the Office of Space and Terrestrial Applications-1 (OSTA-1) experiment platform to space. The STS 2 launch set for 9 October 1981 was rescheduled when a nitrogen tetroxide spill occurred during loading of the forward reaction control system. The launch on 4 November was delayed, and then scrubbed, when the countdown computer called for hold in the count due to an apparent low reading on fuel cell oxygen tank pressures. During the hold, high oil pressures were discovered in two of the three auxiliary power units (APUs) that operate the hydraulic system. The APU gear boxes were flushed and the filters replaced, forcing the launch to be rescheduled. The launch on 12 November 1981 was delayed two hours 40 minutes to replace a multiplexer/demultiplexer, and an additional nine minutes 59 seconds to review systems status. The modifications to the launch platform to overcome the previously observed solid rocket booster overpressure problem were found to be effective. The planned five-day mission was cut nearly three days due to failure of one of the three fuel cells that produce electricity and drinking water, but 90 percent of the mission objectives achieved, including the first time remote manipulator system tests. Mission scientists were satisfied with data from the Office of Space and Terrestrial Applications-1 (OSTA-1) Earth observation experiments mounted on Spacelab pallet in the payload bay. No tiles were lost during the flight, but about a dozen were damaged. STS 2 ended 14 November 1991 when Columbia landed on revolution 37 on Runway 23, Edwards Air Force Base, California. Rollout distance: 7,711 feet. Rollout time: 53 seconds. Launch weight: 320,708 pounds. Orbit altitude: 157 nautical miles. Orbit inclination: 38.0 degrees. Mission duration: two days, six hours, 13 minutes, 12 seconds. Miles traveled: 1.075 million. The mission was shortened by approximately three days due to the number one fuel cell failure. The orbiter was returned to the Kennedy Space Center on 25 November 1981. The flight crew for STS 2 was: Joseph H. Engle, Commander; Richard H. Truly, Pilot. During the 6h 0m STS-51-A-1 EVA, NASA shuttle Discovery astronauts Allen and Gardner snared and retrieved the Palapa-B2 satellite, performing the first space salvage operation. The STS 51-A shuttle mission launch attempt on 7 November 1984 was scrubbed during a built-in hold at T-20 minutes due to wind shears in the upper atmosphere. The countdown 8 November 1984 proceeded as scheduled. The Canadian communications satellite TELESAT-H (ANIK), attached to a Payload Assist Module-D (PAM-D), was deployed into geosynchronous orbit on flight day two. On the third flight day, the defense communications satellite SYNCOM IV-1 (also known as LEASAT-1) was deployed. Allen and Gardner, wearing jet-propelled manned maneuvering units, retrieved two malfunctioning satellites: PALAPA-B2 and WESTAR-VI, both deployed on Mission 41-B. Fisher operated the remote manipulator system, grappling the satellites and depositing them in payload bay. The middeck payloads were the Diffusive Mixing of Organic Solutions (DMOS) and Radiation Monitoring Equipment (RME) experiments. STS 51-A ended on 16 November 1984 when Discovery landed on revolution 127 on Runway 15, Kennedy Space Center, Florida. Rollout distance: 9,454 feet. Rollout time: 58 seconds. Launch weight: 263,324 pounds. Landing weight: 207,505 pounds. Orbit altitude: 185 nautical miles. Orbit inclination: 28.5 degrees. Mission duration: seven days, 23 hours, 44 minutes, 56 seconds. Miles traveled: 3.3 million. The crew for STS 51-A was: Frederick H. Hauck, Commander, David M. Walker, Pilot, and Mission Specialists Anna L. Fisher (the first "mom" in orbit), Dale A. Gardner, and Joseph P. Allen. Roger Lewis (11 January 1912, Los Angeles - 12 November 1987, Washington, DC) was an American manager. He was Chairman of General Dynamics and the first president of the government-owned railway company Amtrak. Roger Lewis grew up as the son of a Union Pacific Railroad ticket vendor. Later he studied at Stanford University. In 1938, he married Elly Thummler of the Netherlands. After graduating, he began working in Sheet Metal Processing at Lockheed Aircraft in 1934. In the following years, he held various positions at Lockheed. During the Second World War, he held primary responsibilty for purchase and ensuring aircraft production always had enough material available. 1947-1950 he worked as a vice president at Canadair in Montreal, Canada. After that, he was Vice President of Curtiss-Wright. From 1953 to 1955 he served as Assistant Secretary to the United States Secretary of the Air Force in charge of procurement. In 1955 he moved back to the private sector. For the next seven years Roger Lewis served as executive vice president of central administration at Pan Am. There he was responsible for some projects for national defense. In 1962, Henry Crown hired him to run the financially ailing aircraft group General Dynamics. He served as Chairman, President and CEO in succession, and successfully eliminated the company's financial difficulties. In 1966, he and other managers forced Crown to relinquish his majority stake in the company. In 1970, General Dynamics again ran into financial difficulties, due to problems with the F-111 fighter-bomber and the shipyard in Quincy, Massachusetts. Consequently, Crown regained control, and Roger Lewis left the company. In April 1971 he became the first president of the quasi-public National Railway Passenger Corporation (dba Amtrak). His work was heavily criticized because he failed to reduce the deficit and rail service was reduced by half. His contract ended in 1975, and he was replaced by Paul H. Reistrup. Thereafter, Roger Lewis worked as a consultant for various companies. Tim Berners-Lee published a formal proposal for the World Wide Web. NASA turned off GOES 6 after nearly 11.5 years of supporting weather prediction. GOES 6, launched 28 April 1983, was the eighth in a series of NASA developed, NOAA operated, geosynchronous spacecraft. It carried (1) a visible infrared spin scan radiometer (VISSR) atmospheric sounder (VAS) to provide high quality day and night cloud cover data, to take radiance derived temperatures of the Earth/atmosphere system, and to determine atmospheric temperature and water vapor content at various levels, (2) a meteorological data collection system to relay processed data from central weather facilities to regional stations equipped with APT and to collect and retransmit data from remotely located Earth-based platforms, and (3) a space environment monitor (SEM) system to measure proton, electron, and solar X-ray fluxes and magnetic fields. The cylindrically shaped spacecraft measured 190.5 cm (6.25 ft) in diameter and 230 cm (7.5 ft) long, exclusive of a magnetometer that extended an additional 83 cm (32.7 inches) beyond the cylindrical shell. The primary structural members were a honeycombed equipment shelf and a thrust tube. The VISSR telescope, which was mounted on the equipment shelf, viewed the Earth through a special aperture in the side of the spacecraft. A support structure extended radially from the thrust tube and was affixed to the solar panels, which formed the outer wall of the spacecraft to provide the primary source of electrical power. Located in the annulus-shaped space between the thrust tube and the solar panels were stationkeeping and dynamics control equipment, batteries, and most of the SEM equipment. Proper spacecraft attitude and spin rate (approximately 100 rpm) were maintained by two separate sets of jet thrusters mounted around the spacecraft equator and activated by ground command. The spacecraft used both UHF band and S band frequencies in its telemetry and command subsystem. A low power VHF transponder provided telemetry and command during launch and then served as a backup for the primary subsystem once the spacecraft attained synchronous orbit. GOES 6 was moved from its 135 deg W position to a more central 98 deg W position when GOES 5 failed on 29 July 1984. GOES 6 was turned off on 12 November 1994. NASA launched STS 74 (Atlantis 15, Shuttle 73) into orbit for the second Shuttle-Mir docking mission. STS 74 launched 12 November 1995 with a countdown that proceeded smoothly to an on-time liftoff. The planned rendezvous with the Russian Mir space station necessitated a brief launch window of about seven minutes. The liftoff originally set for 11 November was scrubbed due to unacceptable weather at the Transoceanic Abort Landing (TAL) sites. STS 74 marked the second docking of US Space Shuttle to the Russian space station Mir, continuing Phase I activities leading to construction of the International Space Station (ISS). The mission illustrated the international flavor of the space station effort: The shuttle crew included Hadfield, the fourth Canadian to fly on the shuttle but the first Canadian mission specialist. The hardware in the payload bay included the Canadian-built Remote Manipulator System (RMS) arm, the US-built Orbiter Docking System (ODS), the Russian-built 316GK Shuttle-Mir docking module and solar array, and a joint US/Russian solar array. Awaiting Atlantis aboard Mir were two Russian cosmonauts and a German cosmonaut, along with Russian and European Space Agency research samples and equipment. Unlike the first docking flight during which a crew exchange took place, the second docking focused on delivery of equipment to Mir. The primary payload of the mission was the Russian-built Docking Module (DM), designed to become a permanent extension on Mir to afford better clearances for Shuttle-Mir linkups. Two solar arrays were stowed on the DM for later transfer to Mir by spacewalking cosmonauts. On flight day three, Hadfield operated the RMS robot arm to lift the DM from its stowed position in the aft section of the payload bay, rotated it to vertical, and moved it to within five inches above the ODS in the forward part of the bay. The ODS is being flown on all Shuttle-Mir docking flights, and serves as a passageway between the two spacecraft. Cameron then fired downward steering jets to push Atlantis against the DM. Once mating was confirmed, the robot arm ungrappled from the DM, hatches between the DM and the ODS were opened, and a centerline camera was mounted inside the top hatch of the DM. On flight day four, Atlantis caught up with Mir. The Terminal Phase Initiation (TI) burn started with Atlantis eight nautical miles (9.2 statute miles/14.8 kilometers) behind Mir to begin the final phase of the rendezvous. Air-to-air communications between Atlantis and the Mir 20 crew also began about the same time. The approach to Mir was same as for STS-71, along the R-bar, with Atlantis closing in on the station from directly below. Handheld lasers were used by the Shuttle crew during the final approach to supplement distance and closing rate information made by orbiter's navigational equipment. The manual phase of the rendezvous began when Atlantis was about a half-mile (804.7 meters) from Mir, with Cameron taking control of the orbiter using the aft flight deck controls. At 170 feet (51.8 meters) from Mir, Cameron halted approach while Mir was maneuvered into alignment for docking. After a "go" from flight directors in Moscow and Houston, Cameron moved Atlantis to 30 feet (9.1 meters) from Mir, and then halted momentarily again to make final adjustments. The key camera for the final approach was the elbow camera on the RMS arm. Hatches between Mir and Atlantis were opened at 4:02 AM EST on 15 November 1995. Control of the DM was transferred to the Mir 20 crew. During mated operations, nearly 1,000 pounds (453.6 kilograms) of water was transferred to Mir. Numerous experiment samples, including blood, urine and saliva, were moved to the orbiter for return to Earth. Shuttle crew also brought up gifts, including Canadian maple sugar candies and a guitar (the second guitar on Mir). Lithium hydroxide canisters, a late addition, were transferred to Mir in case the faulty environmental control system failed again and station's air needed to be "scrubbed." Two spacecraft separated at 4:15 AM EST on 18 November, after which a flyaround of the station was initiated when Atlantis was 400 feet (121.9 meters) away. Also flown on STS 74 were: IMAX Cargo Bay Camera (ICBC); Glow Experiment (GLO-4)/Photogrammetric Appendage Structural Dynamics Experiment (PASDE) Payload (GPP); Shuttle Amateur Radio Experiment (SAREX) II. No significant problems occurred with orbiter or any of cargo bay equipment. STS 74 ended on 20 November 1995 when Atlantis landed on revolution 129 on Runway 33, Kennedy Space Center, Fla. Rollout distance: 8,607 feet (2,623 meters). Rollout time: 57 seconds. Orbit altitude: 213 nautical miles. Orbit inclination: 51.6 degrees. Mission duration: eight days, four hours, 30 minutes, 44 seconds. Miles traveled: 3.4 million. The flight crew for STS 74 was: Kenneth D. Cameron, Commander; James D. Halsell, Pilot; Jerry L. Ross, Mission Specialist; William S. McArthur Jr, Mission Specialist; Chris A. Hadfield, Mission Specialist. Russia launched Kupon from Baikonur, the first communications satellite for the Russian banking system. Russia launched Kupon on 12 November 1997, the first communications satellite for the Russian banking system, and the first commercial communications satellite sold by the Lavochkin, who had in the past been primarily associated with planetary probes and early warning satellites. Kupon, owned by the Russian Federation Central Bank (and possibly Global Information Systems of Moscow), was intended to relay financial data for the Bankir network. An onboard computer failed after the spacecraft reached orbit, rendering it inoperable. It was positioned in geosynchronous orbit at 55 deg E 1997-1998. As of 1 September 2001, it was at 86.25 deg E drifting 0.142 deg W per day. An Ariane 44L launched from Kourou carried Sweden's Sirius 2 (Astra 5A) and Indonesia's Cakrawarta 1 communications satellites into space, which were initially positioned in geosynchronous orbit at 5 deg E and 107 deg E, respectivly. During the 5h 5m ISS EO-3-3 EVA, International Space Station ISS EO-3 mission astronauts Culbertson and Dezhurov completed external connections for the Pirs module where the spacewalk originated, and finished setting up the Kurs rendezvous system. NASA's Mars Odyssey orbiter conducted a maneuver to enter the new morning-daylight orbit it had been drifting toward since February 2014. The new orbit is for observation of ground temperature changes after sunrise and sunset on Mars. NASA's 2001 Mars Odyssey is the remaining part of the Mars Surveyor 2001 Project, which originally consisted of two separately launched missions, The Mars Surveyor 2001 Orbiter and the Mars Surveyor 2001 Lander. The lander spacecraft was cancelled as part of the reorganization of the Mars Exploration Program at NASA. The orbiter, renamed the 2001 Mars Odyssey, was nominally planned to orbit Mars for three years with the objective of conducting a detailed mineralogical analysis of the planet's surface from orbit and measuring the radiation environment. The mission had as its primary science goals to gather data to help determine whether the environment on Mars was ever conducive to life, to characterize the climate and geology of Mars, and to study potential radiation hazards to possible future astronaut missions. The orbiter also acted (and is acting, as of 2019) as a communications relay for [future] missions to Mars. It has enough propellant to function until 2025. The 2001 Mars Odyssey was launched aboard a Delta II 7425 on 7 April 2001. In August, during the cruise to Mars, the MARIE instrument failed to respond during a routine data transfer and was put into hibernation. (Attempts to revive the instrument were successful in March 2002, and MARIE began taking scientific data from orbit on 13 March 2002.) After a seven month cruise the spacecraft reached Mars on 24 October 2001. The spacecraft used a 19.7 minute propulsive maneuver to transfer into an 18.6 hour elliptical capture orbit and used aerobraking until 11 January 2002, when the spacecraft pulled out of the aerobraking orbit into a 201 x 500 km orbit. This orbit was trimmed over the next few weeks until it became a 2-hour, approximately 400 x 400 km polar science orbit on 30 January 2002. The science mapping mission began on 19 February 2002, and on 28 May 2002, NASA reported that Odyssey's GRS had detected large amounts of hydrogen, a sign that there must be ice lying within a meter of the planet's surface. The Orbiter acts as a communications relay for the Mars Exploration Rovers (Spirit and Opportunity) which arrived in January 2004, the Mars Science Laboratory rover Curiosity, and will possibly also do so for other future missions. Data was collected from orbit until the end of the 917 day nominal mission in July 2004, and the mission was first extended for another Martian year, until September 2006. One of the orbiter's three flywheels failed in June 2012. However, Odyssey's design included a fourth flywheel, a spare carried against exactly this eventuality. The spare was spun up and successfully brought into service. Since July 2012, Odyssey has been back in full, nominal operation mode following three weeks of 'safe' mode on remote maintenance. On 11 February 2014, mission control accelerated Odyssey's drift toward a morning-daylight orbit to "enable observation of changing ground temperatures after sunrise and after sunset in thousands of places on Mars". The desired change occurred gradually until the intended orbit geometry was reached on 12 November 2015 when another maneuver was conducted to halt the drift. The new observations could yield insight about the composition of the ground and about temperature-driven processes, such as warm-season flows observed on some slopes, Martian morning clouds seen by the Viking Orbiter 1 in 1976, and geysers fed by spring thawing of carbon dioxide (CO2) ice near Mars' poles. The 2001 Mars Odyssey carries star cameras, the Mars Radiation Environment Experiment (MARIE), which measures the near-space radiation environment as related to the radiation-related risk to human explorers, the Thermal Emission Imaging System (THEMIS), which maps the mineralogy of the Martian surface using a high-resolution camera and a thermal infrared imaging spectrometer, and the Gamma-Ray Spectrometer (GRS), which maps the elemental composition of the surface and determines the abundance of hydrogen in the shallow subsurface. The main body of the 2001 Mars Odyssey is a box of 2.2 meters x 1.7 meters x 2.6 meters. The orbiter is divided into two modules, the upper equipment module and the lower propulsion module. The equipment module holds the equipment deck which supports the engineering components and the science instruments. Above the equipment module, connected by struts, is the science deck, holding the star cameras, high energy neutron detector, UHF antenna, the THEMIS instrument and a deployable 6 meter boom holding the gamma sensor head for the GRS. A set of solar array panels extends out from one side of the main bus. A parabolic high-gain dish antenna is mounted on a mast extending from one corner of the bottom of the bus. The MARIE instrument is mounted inside the spacecraft. In the propulsion module are the fuel, oxidizer and helium pressurization tanks, and the main engine. The main engine is a hydrazine and nitrogen tetroxide rocket which can produce 65.3 kg thrust, mounted in the bottom part of the propulsion module. The spacecraft had a launch mass of 725.0 kg, including 348.7 kg of fuel. Attitude control is provided by four 0.1 kg thrusters and the spacecraft can be turned using four 2.3 kg thrusters. The spacecraft is three-axis stabilized using three primary reaction wheels and one backup. Navigation is provided by a Sun sensor, a star camera, and an inertial measurement unit. Power is provided by the gallium arsenide solar cells in the solar panel and a 16 amp-hr nickel hydrogen battery. Communications between the orbiter and Earth are in X-band via the high-gain antenna, and communications between the orbiter and any Mars landers are via the UHF antenna. Thermal control is achieved using a system of heaters, radiators, louvers, insulating blankets and thermal paint. Command and data handling is through a RAD6000 computer with 128 Mbytes RAM and 3 Mbytes of non-volatile memory.